I hope you willl enjoy this small trip over the weeks and get something out of it. Maybe you’ll find something in addition to improve the concept or you get another idea. If this is the case, feel free to share your ideas or get in contact with us/me. The last time I presented you the flight of albatross and how it converts kinetic energy into potential energy and vice versa. This was to show you some possibilities of creatively using an instinctive mechanism of an animal to stabilize a turbine in a stream. Today I would like to show you the inspiration for the shape of such a “floating turbine”. Of course it needs to be highly aerodynamic. This means that the body of a turbine should have the lowest drag coefficient (cw value) as possible. Why? You may ask… The turbine needs also a generator and nearly all the resistivity against the stream should be located there to increase the efficiency (more about that in Part III). But what is the best inspiration you could choose for an object that will be working completely under water? A fish? A dolphin? Nope, in this case it is a bird. A penguin! More exactly, the Pygoscelis adeliae. The following video will give you an imagination of the penguins themselves. There are no comments included but I hope you can enjoy it like as I do. a usual Porsche 911 has a Cw value of about 0.3. Mercedes built a car with a Cw value of 0.19. Let us now take a look at submarines. Usually submarines are shaped like torpedoes, the classic streamlined bodies that everybody heard about. This shape seems appropriate for an „U-boat“ but it is not reaching the minimum drag values. Did you see that? Yep, you’re right! That is exactly that shape I was talking about. Here are the actual numbers of our penguin friend. Just to understand the Cw value in a more physical experience. The Cw value of 0.05 means that a body has the same resistivity against a flow as a 2€ coin thrown in water, facing forward the thin side! Surprisingly, the value is not as low as the one of a manmade highly optimized shape. 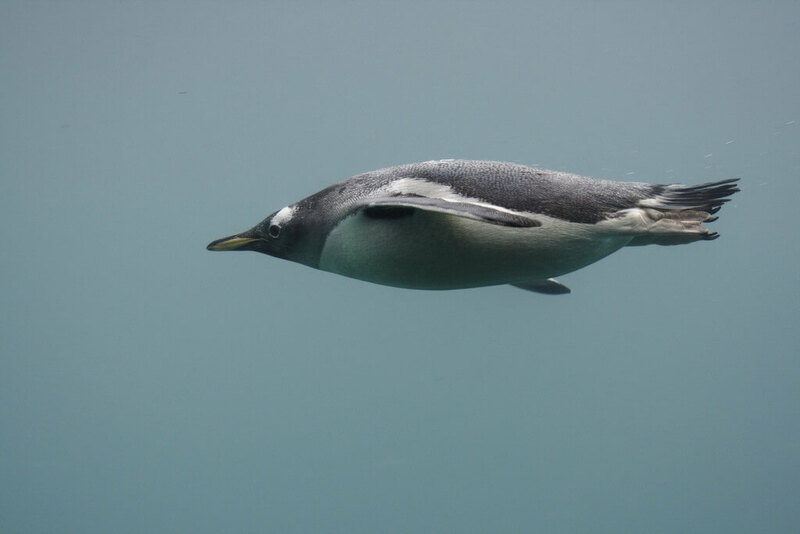 The reason is that the Cw value of a penguin is measured while swimming, which is a dynamic process. The optimized shape, on the contrary, is only recorded in a static state, for easier comparison with established technology. Nevertheless, the Pygoscelis adeliae is chosen as a champion of low drag movement for the design of my floating turbine. I am curious to know whether a bird’s body itself contributes to aerodynamic lift. We know their wings cause birds to fly, hover, stay up in the air. My question is to what extent the body shape itself is of help to stay airborne too. I found some papers about the topic. At the moment I am short of time, but I will work through them and write about the results. It seems that the body lift is important to make the flight of birds „aerodynamically attractive“.